I must admit that although I do have very strong Chinese lineage, I grew up at the other side of town thereby depriving me from living the Oriental life where horse-drawn carriages would go around and around town, where majority would speak the Chinese language (or at least, the more popular dialect called Hokkien), where I can stuff myself with the best tasting dimsums, noodles and a lot more. Needless to say, I'm trying to make up for the loss as I would frequently visit Manila's very own Chinatown otherwise known as Binondo. Thanks to the talent and expertise of Ivan ManDy who conducts fun walking tour around Binondo as he shares his knowledge about his side of town as well as the secret food stops that makes Binondo a must-go place for not only the tourists but for locals as well. Like Ivan, I take pride in showing a bit of my Oriental lineage to my friends. Such was the case when I accompanied three of my dear colleagues to Ivan's Binondo Food Wok one afternoon. 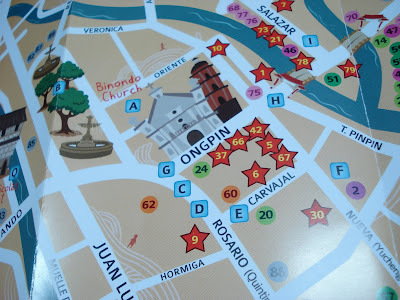 The meeting place was at the plaza fronting the Binondo Church. Note that Binondo can be a very busy place but do not worry, it won't be difficult to spot Ivan (our tour guide that day) as he's dressed in bright red cheong sam and a cute little black cap to complete this look! From the plaza we made our way in as we learn trivias and short anecdotes about Binondo. Of course, Ivan made sure that we do not go hungry as we visit one restaurant to another sampling the best of the best dishes that Chinatown can offer. The tour normally runs for 3 hours but you won't even feel it as every step is truly enjoyable as you mingle, eat and learn! Just recently, Ivan contacted me to tell me a great news! 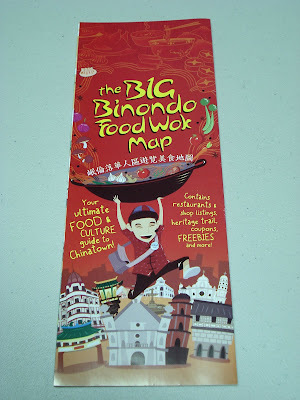 He just came out with a handy map called The Big Binondo Food Wok Map (Php. 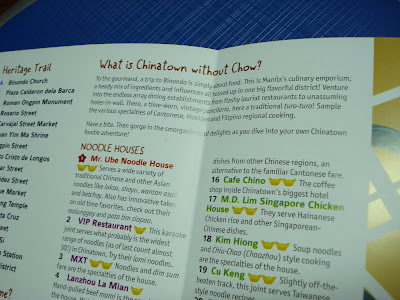 100) that will be one's ultimate guide to the different food stops around Binondo! Just imagine being able to navigate your way around while stuffing yourself happy with the freshest seafood dishes, the best tasting dimsums and a lot more! I'm truly loving the complete listing of restaurants included in the map. In addition to this, the map actually has a number of coupons that you can either cut-out or present to get freebies and discounts! 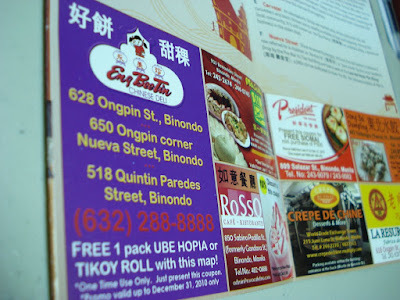 For instance, I can't wait to simply avail of my favorite Eng Bee Tin Tikoy Roll by just presenting my map! This is a perfect time to grab yourself a copy of the map as Binondo will become extra festive as we get closer to the Chinese New Year! Watch out for the exciting dragon / lion dance, food festivals and a lot more! You can get your copy by contacting Ivan ManDy at fun@oldmanilawalks.com / 0917-329-1622. I love the photo too!!! :) Fran, are you going to the hot air balloon festival? we'll see pa sabay kasi with the chinese new year eh. how about u?